The genus Allium is one of the largest genera on the planet, boasting (probably) over 800 species (Friesen et al. 2006, Hirschegger et al. 2009, Mashayehki and Columbus 2014), with most species clustered around central Asia or western North America. Like all of the very speciose genera, Allium includes tremendous variation and internal evolutionary diversification within the genus, and 15 monophyletic (derived from a single common ancestor) subgenera within Allium are currently recognized (Friesen et al. 2006). Only a few have commonly cultivated (or wildharvested by me) species, however, shown on the phylogeny below. Phylogeny of my edible alliums: genus Allium with subgenera (“subg.”) and sections within subgenera (“sect.”) labeled (data from Friesen et al. 2006 and Hirschegger et al. 2010). Click to enlarge. Some popular allium species, including onion (A. cepa var. 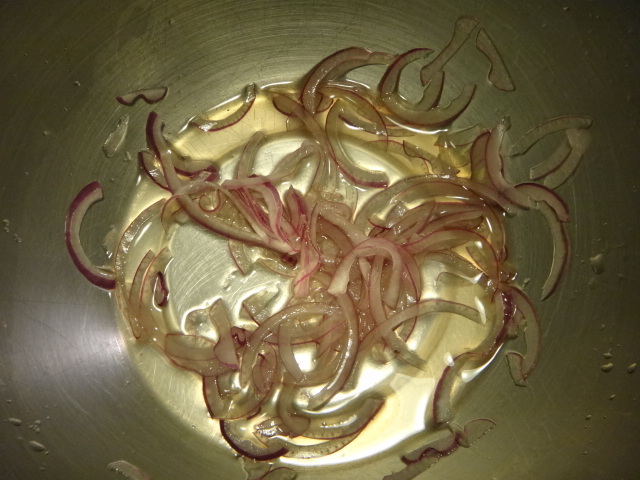 cepa), shallots and potato onion (A. cepa var. aggregatum), garlic (A. sativum), and leek (A. ampeloprasum), are among the oldest domesticated plants and have been employed since at least the beginning of written history throughout the large region spanning the Mediterranean through central Asia. Onions (A. cepa), garlic (A. sativum), and scallion (A. fistulosum) are only currently known in their cultivated forms, having changed so substantially for so long under domestication that their wild ancestry is ambiguous (Vaughan and Geissler 2009). There are guesses, of course, for the responsible parties among the many wild species in central Asia (such as A. longicuspis for garlic; Volk et al. 2004), where both onions and garlic probably got their starts, but it’s not clear. Some other allium species that are still abundant in the wild are widely cultivated as vegetables and herbs, such as leek and other vegetables derived from wild A. ampeloprasum, chives (A. schoenoprasum), which is one of the few alliums native to both North America and Eurasia, garlic chives (A. tuberosum), and A. polyanthum. Some alliums are simply grown for their handsome flower umbels, but they’re edible, too. The vast majority of the 800ish allium species smell garlicky or oniony, and, as far as I know, all parts of all of them are edible. To paraphrase what Greene Deane said in his post about eating some wild alliums native to the eastern U.S., if it looks and smells like garlic or onion, it’s edible. Many wild allium species were important food sources for indigenous peoples, and some are still popular wild vegetables today. 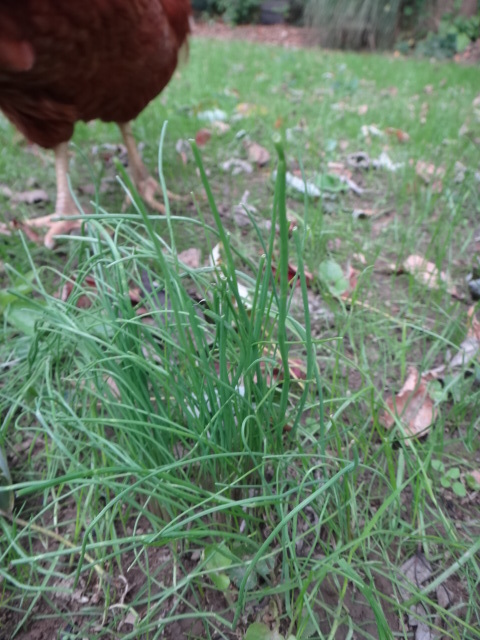 I’ve used the wild garlic (A. vineale) and wild onion (A. canadense) that grow in the yard as chives in the kitchen and nibbled them on camping trips, and before we moved two years ago, we had a spot (in New Jersey) to harvest ramps (wild leeks; A. tricoccum) in the spring, but we don’t have a spot now (near DC), and ramp spots are like morel or other awesome mushroom spots: nobody divulges his or her spot. You have to find one on your own (and not overharvest). If you’re curious about harvesting wild alliums, do use your nose. The alliums are closely related to many very poisonous wild lilies (Allium is in the same family as amaryllis, Amaryllidaceae) and superficially resemble them, with similar long, thin leaves and umbels of star-like flowers. None of the poisonous lilies smell like garlic or onion, though. Some wild alliums, including A. vineale, are noxious weeds that affect wheat and dairy farmers. The little bulbils (tiny bulbs, see below) that form alongside flowers in the umbels (cluster of flowers on the top of a stalk) of A. vineale mature around the same time as wheat seeds and are about the same size, so bulbils are often harvested along with wheat seeds and are difficult to separate from them, leading to contamination of the wheat crop (and garlic bread?) (Block 2010). Nursing mothers are often warned that compounds from certain foods they eat, including alliums, can end up in their milk and may upset a baby’s digestion. This is apparently also the case for cows. If dairy cows eat wild alliums growing in their pastures, the aromatic compounds can end up in their milk, causing an oniony flavor (Block 2010). The oniony flavor in milk is described as a bad thing, and it would be for many uses of milk, but I wonder if it wouldn’t in fact be a good thing for savory applications, like hard cheeses or ricotta destined for something like the filling of a greens pie (such as the brimstone tart, below). Wild alliums, like the wild relatives of many cultivated species, have higher concentrations of defense compounds, and therefore stronger flavors, than domesticated alliums (Fritsch and Keusgen 2006). And for those strong flavors, love them or hate them, we can thank their wild enemies. I designed a lab for an undergraduate evolution course that demonstrated general evolutionary principles using edible plant examples. One module presents culinary spices as chemical warfare agents in plants’ ongoing evolutionary arms races against the pathogens and herbivores that would consume them. The story goes like this: a plant arrives on a chemical that harms or detracts some or all of its attackers, and, in evolutionary retaliation, some subset of those attackers arrive at a way to circumvent said chemical. In response, the defense compound in the plant changes, causing a reactionary change in the pathogens or herbivores. The process is an example of coevolution, in which different species mutually evolutionarily respond to one another, and repeats itself over generations. Over time this ratcheting can lead to extreme specialization of an herbivore or pathogen on a particular plant species and is a reason why many pathogens or herbivorous insects can only eat one plant species or one set of closely related species with similar defense chemistry (see the famous landmark paper on the topic using butterflies and their hostplants as an example by Ehrlich and Raven (1964)). For example, I’ve whined on the blog already (here and here) about the Pieris cabbage butterfly caterpillars whose ancestors bequeathed to them the physiology necessary to counteract the glucosinolate defense compounds in the cruciferous vegetables (family Brassicaceae) in my garden. This specialization of different insects on different plant lineages also contributes to diversity of defense compounds within plants, of which there is a dizzying array across the global flora. Some plant defense chemicals are toxic to people, too, and some of these are famous poisons (see Amy Stewart’s Wicked Plants for awesome descriptions). Other plant defense compounds, however, are nontoxic to humans, at least in small quantities. The flavorful constituents of our culinary spices are among these latter compounds. Similarities of defense compounds among closely related plants, variations on a chemical theme, explain why closely related plants often have similar flavors. It turns out that some of those spicy chemicals also inhibit the bacteria that can cause food to spoil or cause foodborne illness in people, and there’s some support for the hypothesis that humans have long incorporated spices into food in part to preserve it and prevent food poisoning, especially before modern refrigeration. Jennifer Billings and Paul Sherman (1998) compiled the literature on the ability of 30 spices to inhibit foodborne bacteria (see chart below). Antimicrobial properties of 30 spices, from Billings and Sherman 1998. The spice species are arrayed from the greatest to least effectiveness at inhibiting microbes. Each bar indicates the fraction of all food-spoilage bacterial species (which ranged from 4 to 31) on which the spice or its phytochemicals have been tested (in any concentration) in the laboratory that were killed or whose growth was inhibited. Garlic and onion (along with allspice and oregano) killed all of the tested spices. Billings and Sherman used those data to determine that typical recipes from places with hot climates, where foodborne bacteria might proliferate to the most devastating effect, have a tendency to incorporate spice combinations or concentrations that are more effective against bacteria than do recipes from cooler climates. Antimicrobial capacity is not, of course, the only reason we choose spices for our food, but perhaps it is or was a contributing factor. In the lab I asked students to choose one of the 30 spice species from that graph from Billings and Sherman and to look up some primary literature about the compounds it uses against its enemies. Every time we did the lab, nearly all the students chose garlic or onion, the two most common of the many alliums. More than one student essay included the heartwarming sentence “I love garlic,” or “I put it in everything.” One student, however, chose allspice from the list because: “it kills as many microbes as garlic and onion, and I hate garlic and onion.” For the record, I didn’t ask students to justify their choice in their lab reports; they just volunteered this commentary. Student comments such as these contributed to my own sense of justification in creating a lab that forced them to contemplate biological perspectives of familiar plants that were emotionally evocative or about which they already had strong opinions. Onion slices macerating with salt and apple cider vinegar while I do other stuff. All my coleslaws and grain or bean salads begin with this quick onion pickle. Like heat, acid and salt must transform the thiosulphinates into less aggressive sulfurous compounds. There are a handful of different cysteine sulphoxides that accumulate in notable concentrations in alliums (Fritsch and Keusgen 2006). Different mixes of cysteine sulphoxide derivatives (thiosulphinates) characterize the aroma and flavor of individual allium species (or groups of closely related allium species) (Fritsch and Keusgen 2006). This is why the flavor of garlic is distinct from that of onion or leek or some of the wild species. Alliin is the dominant cysteine sulphoxide in garlic; isoalliin dominates onion; and isoalliin and propiin dominate leek. Another cysteine sulphoxide, methiin, has a particularly unpleasant flavor and characterizes the flavor of many wild species, which may explain why many of them are not utilized more frequently as food (Fritsch and Keusgen 2006). In garlic, alliinase transforms alliin into allicin, the thiosulphiate that gives raw garlic its characteristic aroma and “hot” flavor. Allicin feels “hot” because it activates two of the neural pain receptors in our mouths (TRPV1 and TRPA1) that are responsible for sensing excessive thermal heat (Macpherson 2005). TRPV1 is the receptor also triggered by capsaicin in chili peppers (Capsicum), and TRPA1 is triggered by glucosinolate-derived mustard oils. Allicin and other thiosulphinates in alliums are thermally unstable and break down when heated into various diallyl sulfides. These derivative sulfurous compounds are still flavorful and aromatic (they’re what you smell over time when something with onions is roasting or braising in your kitchen), but they lack that bite in the mouth because they can no longer activate those pain receptors in this form (Macpherson 2005). Incidentally, thiosulphinates may attach themselves to the pain receptors in the same way that they attach themselves to bacterial cellular machinery, which ends up inhibiting bacterial growth (Block 2010). In onions, an alliinase transforms the cysteine sulphoxide isoalliin into the sulfenic acid 1-Propenesulfenic acid. Then a second enzyme, appropriately named lachrymatory factor synthase, transforms the 1-Propenesulfenic acid into the highly volatile gas thiosulphinate syn-propanethial-S-oxide. The nerve endings in the cornea of the eye respond to syn-propanethial-S-oxide in proportion to its concentration in the air wafting up from a cut onion and prompt the tear ducts to produce tears to flush the irritant (Scott 1999, Block 2010). Tearless onions have been genetically engineered by a simple, surgical mechanism: “silencing” the gene that encodes for the lachrymatory factor synthase enzyme. 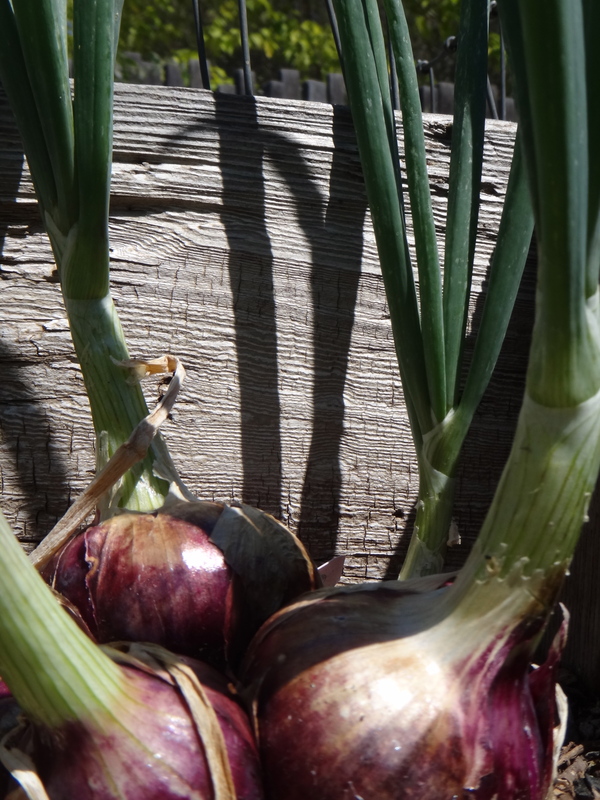 These transgenic onions produce all of the sulfur-containing compounds that give alliums their antimicrobial and putatively health-enhancing benefits with less pungency and without causing tears (Block 2010). You may find that “Vidalia” or other “sweet” onions, which were not produced transgenically, smell and taste less pungent and are quite sweet. These cultivars do not take up sulfulr from the soil as effectively or allocate sulfur to cysteine sulfoxides as much as the more pungent cultivars. Additionally, they may be grown in certain locations with low-sulfur soils, which demonstrably reduces cysteine sulfoxide content in all cultivars (Block 2010). All onions, regardless of cysteine sulfoxide content, can produce large bulbs with high sugar contents (like a Vidalia); that’s why caramelized onions taste sweet no matter the variety they’re made from. They are, after all, organs designed to store the plant’s energy over the dormant period in the form of sugars. The size of the bulb and its sugar content ultimately depend on how much photosynthesis (sugar generation) the leaves were able to do during the growing season. Garlic cloves and leek pseudostems are also carbohydrate storage organs and also therefore have sweetness behind the sulfur. The parts of onions, shallots, garlic and elephant garlic that we eat are botanically bulbs, carbohydrate storage organs composed of highly modified stems and leaves that grow underground or on the soil surface. Bulbs are employed by many monocot species in the orders Liliales and Asparagales (think tulip and amaryllis) and one eudicot genus (Oxalis). Plants that make bulbs start out as green shoots with leaves and a flowering shoot (inflorescence) originating from a very short, squat disk-like stem, so that it looks like they’re all coming out of the same place. 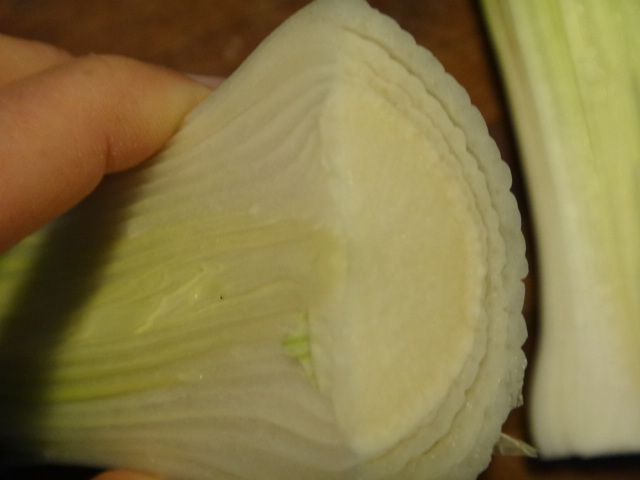 The bases of the leaves might even be tightly overlapping and long, forming a pseudostem around the flowering stalk, evident in leek, garlic, and onion plants (and banana plants). The bulb stores carbohydrates and other nutrients during the dormant part of the year to fuel shoot and flower growth in the following growing periods. 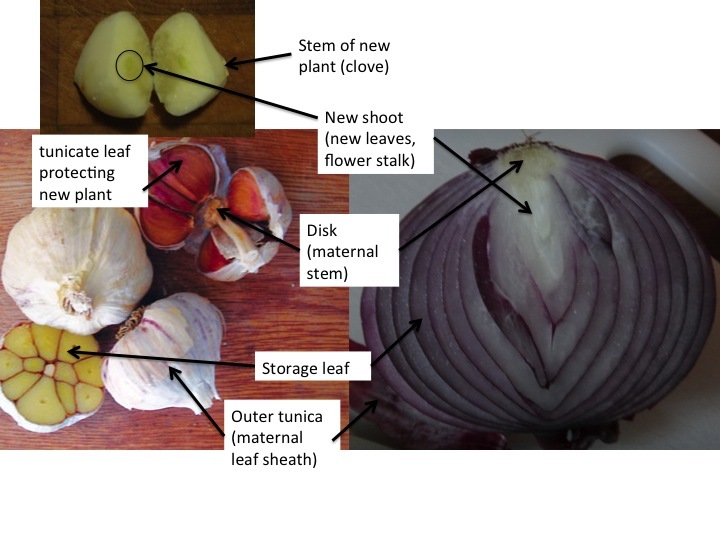 To make an onion bulb, the tightly overlapping leaf bases in the onion plant swell with stored carbohydrate, and the bases of the outermost leaves becomes brittle, paper-like “tunicas.” Inside the swelling leaf bases, new leaves are continuously being formed from the apical meristem growth point on the disk-like stem, and most of them will never sprout but only exist to store carbohydrate and other compounds. The bulb grows as the leaf bases swell and the new storage leaves grow. The storage leaves surround the developing shoot of new leaves and a flower stalk that will sprout the following year. Many allium species reproduce asexually by producing small bulbs that sprout from the outside of the squat disk stem, from axial meristems (see the B. oleracea post for a description of the various meristems in a shoot). In garlic and elephant garlic, these new bulbs are called “cloves” and consist of a new growing shoot surrounded by a single large storage leaf encased within a single tunicate leaf (the garlic “peel”). The new small bulbs grow in a ring around the disk stem, encased within the papery tunicate leaf bases from the parent plant (see labeled photos of garlic and onion below). The new small bulbs in the multiplier onions (shallot, potato onion) develop similarly to garlic but can consist of many storage leaves within the new tunic. If left to their own devices, eventually the garlic cloves and new shallots would outgrow the maternal tunicate case and will develop their own root system from their own little disk stems and send up their own shoots. 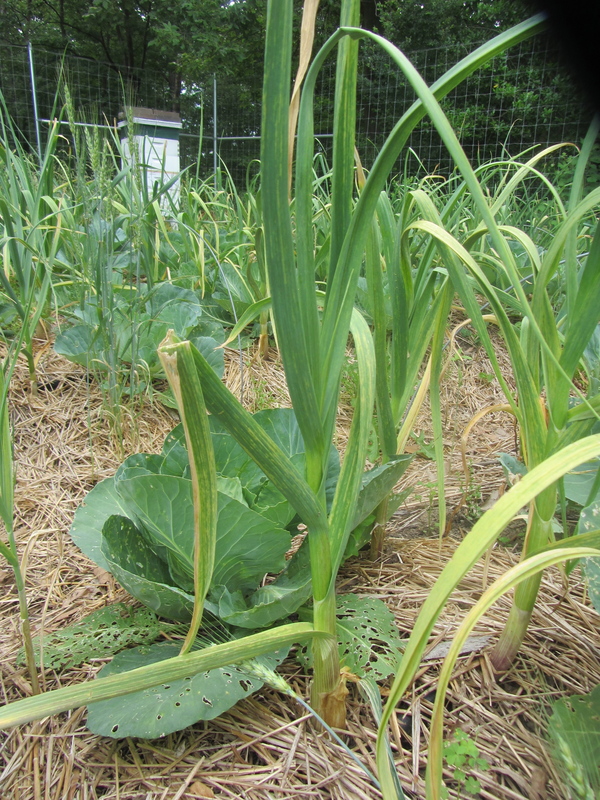 This is why you can plant individual garlic cloves (or individual shallots or potato onions or small onion bulbs) in the fall and get big heads of garlic or shallot (or an onion bulb) from each one the following summer. Impressive morphological variation exists within individual Allium species, including the domesticated species A. ampeloprasum and A. cepa. The common single-bulb onion is a variant of A. cepa distinct from conspecific multiplier onions, which include shallots and potato onions. The multiplier onions get their name from their tendency to produce clumps of small bulbs from a single planted bulb, more like garlic. Domestication of four subspecies of A. ampeloprasum modified different plant structures in each lineage. 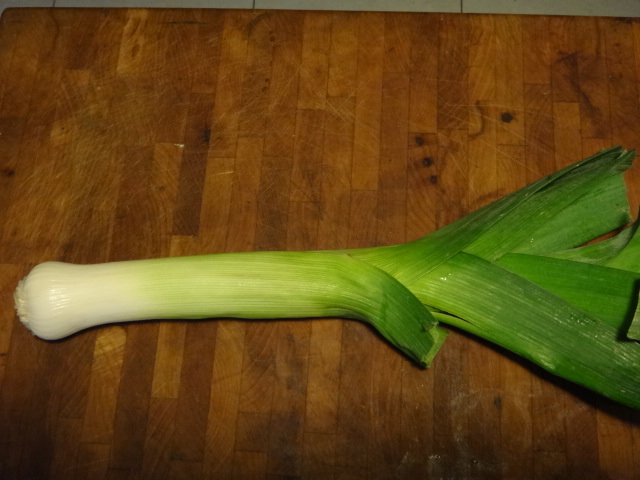 Domestication of the leek subspecies amplified the pseudostem, formed by tightly packed overlapping leaf bases, just like in the plants of fellow monocot banana. The aerial, photosynthesizing portions of the leek leaves become too tough to eat, so to increase the amount of tender pseudostem in the harvested crop, dirt is piled up over the pseudostem, a farming technique called “hilling” that blanches the pseudostem, making it pale and tender. Pearl onions from A. ampeloprasum are small lateral bulbs that develop off the main stem, each with a tunica encasing multiple, thin storage leaves and an immature shoot. 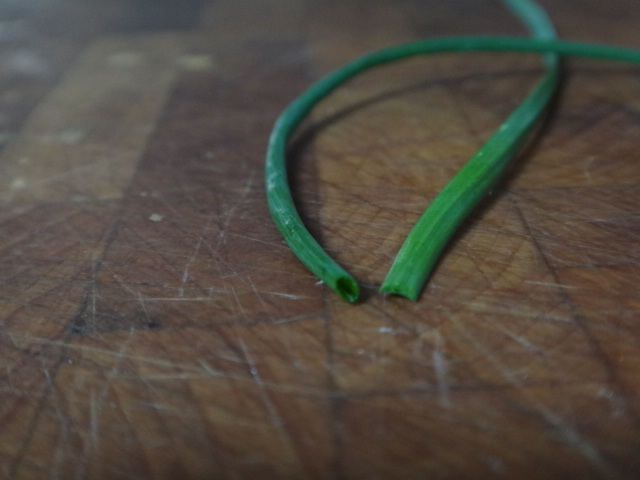 Elephant garlic develops cloves like A. sativum garlic, from lateral buds off the disk stem, each with a tough, dry tunicate leaf covering a single, large storage leaf and an immature shoot. Kurrat varieties, popular throughout the Middle East, don’t develop a large pseudostem like leek or lateral bulbs but instead are grown for their leaves, which are much more tender than leaves in the other varieties. 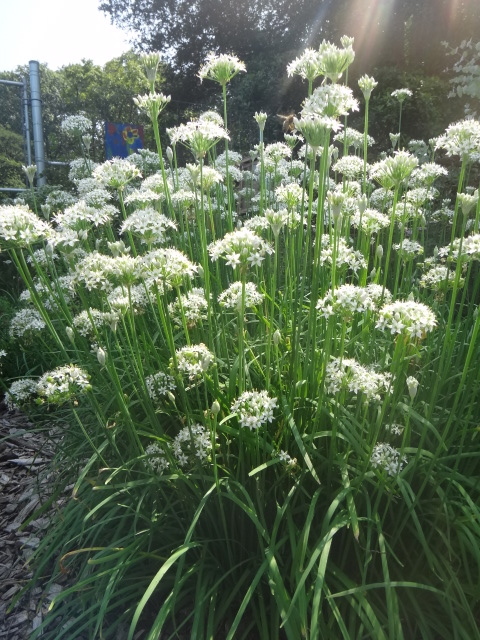 Species we typically grow for leaves or bulbs (onions, chives, garlic, leeks) have beautiful flower clusters, too, and also contain lots of sweet nectar to complement their oniony-garlicky flavor and make attractive edible flowers for garnishes or salads. 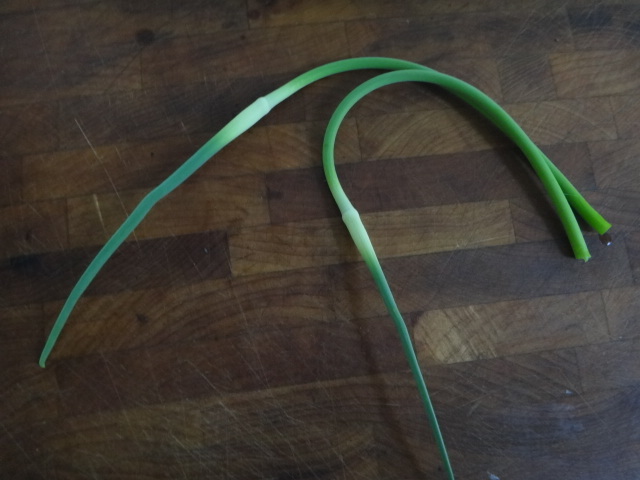 The immature flowering stalks (inflorescences) are called “scapes.” Garlic scapes can be found in farmer’s markets in the spring. They have a mild garlic flavor and can be used like a scallion or ground into sauces, like pesto, or soup. If left to develop, the garlic inflorescence would produce an umbel composed mostly or entirely of bulbils, tiny bulbs, instead of flowers. 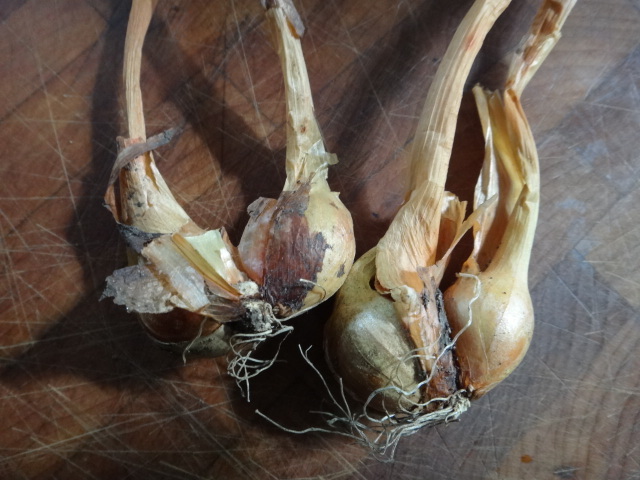 A garlic bulbil is like a very tiny garlic clove, with a tunica leaf covering a starchy storage leaf surrounding buds that could become leaf and inflorescence, if the bulbil were planted in the ground. 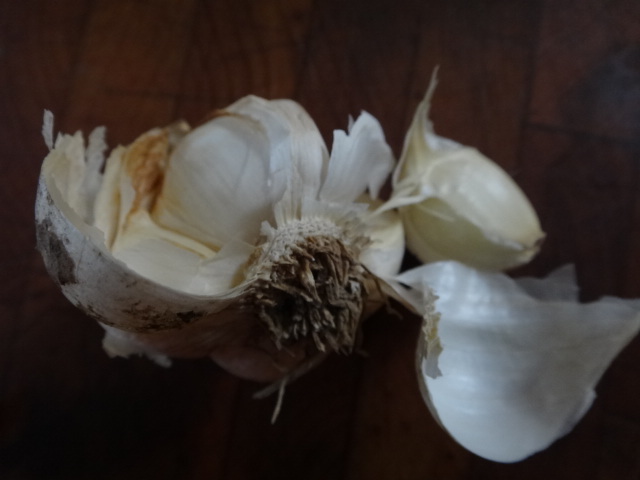 Because bulbils replace most or all garlic flowers, most garlic varieties rarely or never produce viable seeds and have almost exclusively been propagated asexually from cloves and bulbils for millennia. 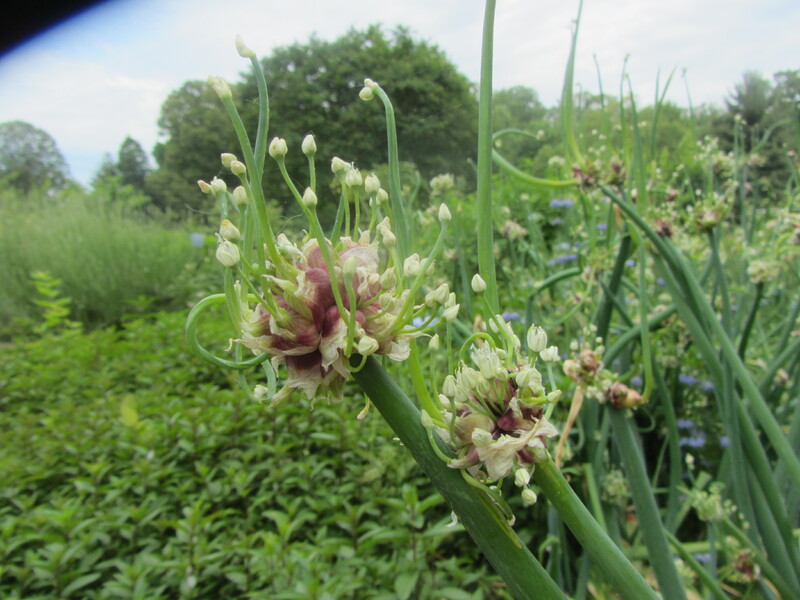 Picking the scapes forces the garlic plant to invest energy it would have allocated to the flowers and bulbils into the bulb, which is where most people want it. 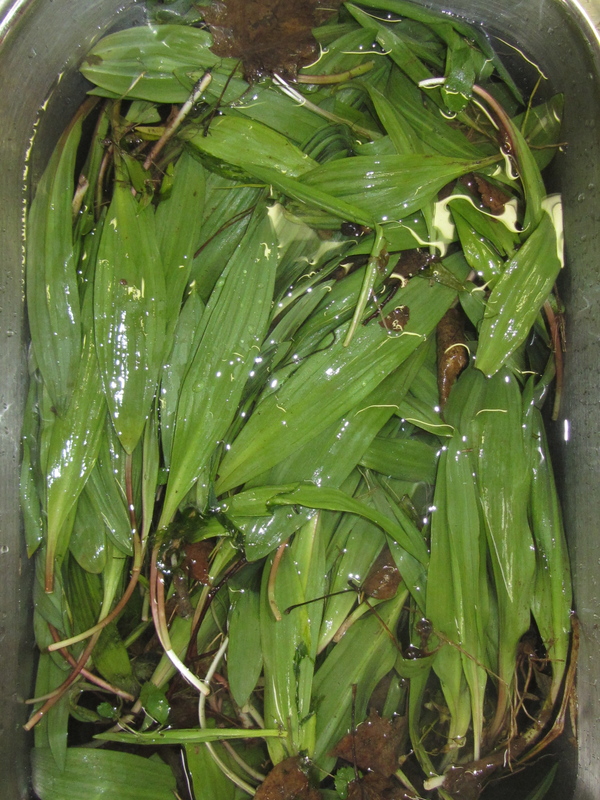 Garlic and wild garlic are far from the only alliums that produce bulbils. Walking onions, or “tree” onions, have such large bulbils in their inflorescences that they can be picked and peeled like pearl onions. The umbels (flower head with clustered bulbils and flowers) becomes so heavy with these large bulbils that they nod down to the ground, whereupon the bulbils sprout roots and shoots and become progenitors of a new plant, as if the onion plants were “walking” across the landscape. 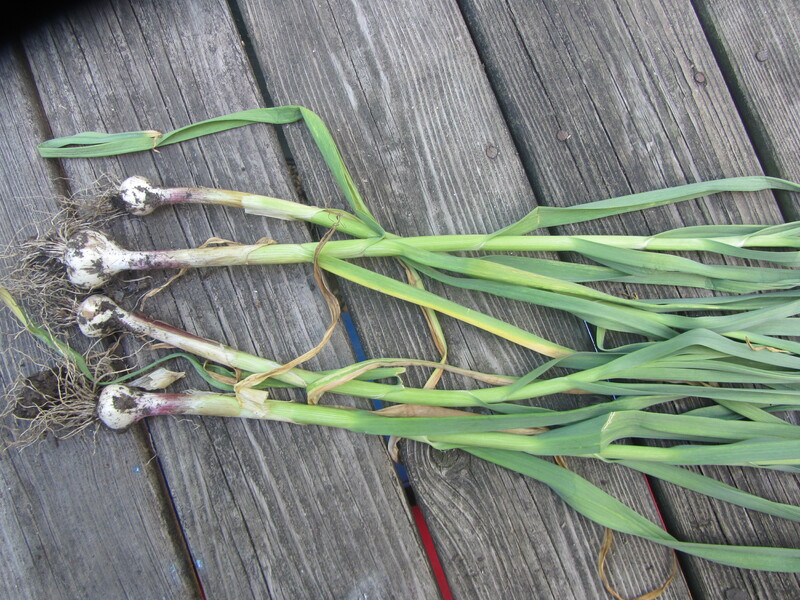 Commercially available walking onions are considered hybrids of A. cepa and A. fistulosum, which itself is called “scallions” and is grown for its tender greens and very tiny bulbs, although the young aerial parts of a great many cultivated and wild alliums can be harvested and used fresh like “scallions” as well. Along with the scapes, you may also see early season “green” garlic available in markets, perhaps as a whole plant. This is the young, immature plant with a soft bulb, picked before the tunicate leaves have become coarse, and the garlic flavor is mild. 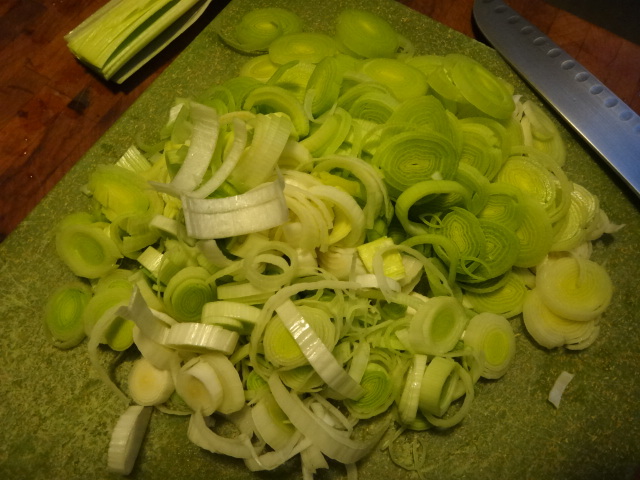 The whole immature bulb and tender lower portions of the stalk can be sliced and used like a leek, and, like with leek tops, the upper stalk and leaves should be saved for making a lovely garlicky soup stock (the leaf tops are too tough to eat as a vegetable). Leeks, garlic and garlic chives all have flat leaves instead of hollow, tapered, cylindrical “terete” leaves in onions, chives and scallions. Both leaf types appear to evolutionarily wax and wane within the genus, perhaps partially in response to habitat aridity (Mashayekhi an Columbus 2014). Cysteine sulphoxides are found in many cruciferous species (family Brassicaceae), too (Fritsch and Keusgen 2006, Kubec et al. 2001), although I don’t know which enzyme acts on them in crucifers. The Latin name of the cruciferous genus Allaria means “garlic-like” and includes the weed commonly called “garlic mustard” (Alliaria petiolata), which is known for its “garlicky” aroma. I think that crucifers and alliums taste awesome together in a multitude of species combinations and preparations, from a raw coleslaw with cabbage and onions to a leek-and-greens tart (recipe below). Maybe their high sulfur content has something to do with their affinity for one another. You can only call the concoction below brimstone tart if you use a cruciferous vegetable for the greens, thereby including two genera with sulfurous defense chemistry: Brassica and Allium. Kale, mustard greens, turnip greens, and radish leaves seem like good choices for the greens in this recipe. You can make this with any set of greens that will cook down, though (chard, spinach, and amaranth greens are also good choices here, but those are in the goosefoot family and are therefore not crucifers or sulfurous). You may find it easier to steam the greens just until they wilt before you chop them and mix them in with the sautéed leeks, but it’s okay to coarsely chop them first and then wilt them in with the leeks, but you have to make sure you’ve got enough room for that in your pan (and probably a lid). If you’re using chard, you can use the entire midrib and petiole (often informally incorrectly called “stem”), diced fine. I tend to remove the toughest parts of the midribs and petioles from the cruciferous greens, though. I like an egg-enriched pastry dough for the shell, but use whatever crust recipe you’d like. If you don’t have leeks, use onions. The dairy in this, too, is really flexible. I’ve made this with all cream, half strained (“Greek”) yogurt and half cream, half cream and half milk, half ricotta and half cream. Sour cream or crème fraiche for part of it would work well, too. 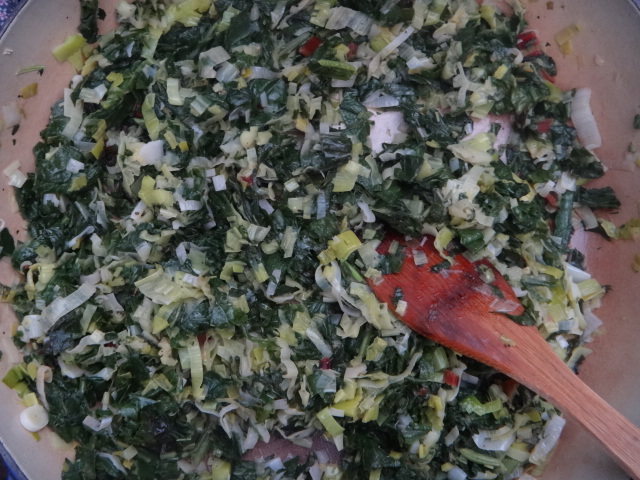 About 2 cups steamed greens (from about 1.5-2 typical grocery bunches), coarsely chopped. Sautee the leeks or onion with the thyme in the butter on medium-low heat while you do the rest, stirring occasionally, letting them soften and begin to caramelize. Steam and chop the greens (or add chopped greens to the leeks after about 10 minutes and put a lid over them to wilt them before stirring them) and add them to the leeks with some salt and pepper, stirring occasionally on low heat, to dry them out a bit, while you make the custard. Whisk the eggs and cream until frothy and liberally season with more salt and pepper. Take the greens and leeks off the heat to cool a bit while you make the pastry and preheat oven to 400 degrees (Farenheit). Cut the butter into the flour and salt with a pastry cutter, butter knives or a food processor until the mixture looks like breadcrumbs. Pour the water with egg over it and mix it together with your hands until it forms a ball. Put some flour on the surface you’ll use to roll out the dough and do so. Press the dough into your tart pan or baking dish (9-inch) and trim off excess dough. 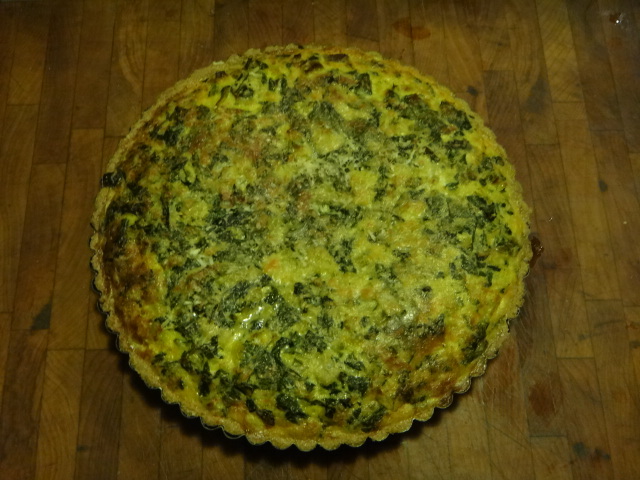 Stir the leek and greens mixture into the cream and egg mixture and pour into the pastry shell. Top with cheese and bake until golden brown on the top, about 45 minutes. Cool for a bit (10-15 minutes) before eating. Billings, J., and Sherman, P. W. 1998. Antimicrobial Functions of Spices: Why Some Like It Hot.” Quarterly Review of Biology 73. Block, E. 2010. 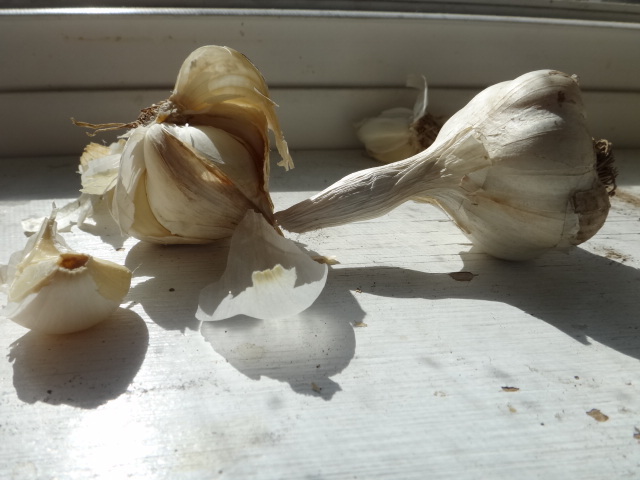 Garlic and Other Alliums: The Lore and the Science. Fritsch, R. M., and M. Keusgen. 2006. Occurrence and taxonomic significance of cysteine sulphoxides in the genus Allium L. (Alliaceae). Phytochemistry 67:1127-1135. Friesen, N., R. M. Fritsch, and F. R. Blattner. 2006. 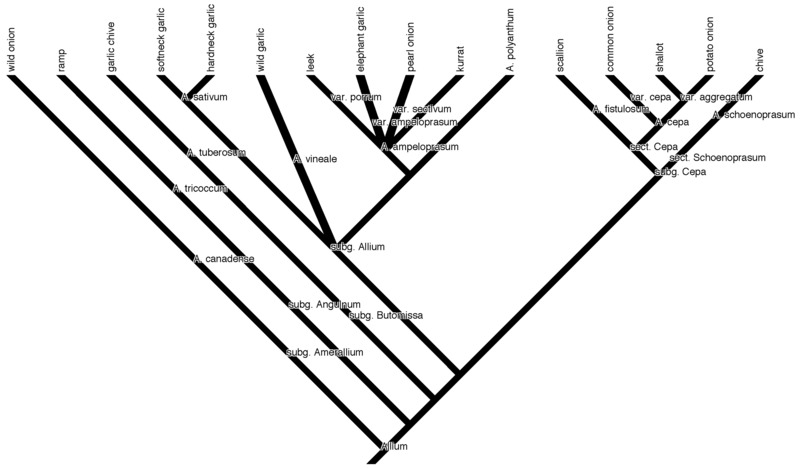 Phylogeny and new intrageneric classification of Allium (Alliaceae) based on nuclear ribosomal DNA ITS sequences. Aliso 22:372-395. Kubec, R., M. Svobodová, and J. Velísek. 2001. Gas-chromatographic determination of S-methylcysteine sulfoxide in cruciferous vegetables. European Food Research and Technology 213:386-388. Macpherson, L. J., B. H. Geierstanger, . Viswanath, M. Bandell, S. R. Eid, S. Hwang, and A. Patapoutian. 2005. The pungency of garlic: activation of TRPA1 and TRPV1 in response to allicin. Current Biology 15:929-934. Mashayehki, S., and J. T. Columbus. 2014. Evolution of leaf blade anatomy in Allium(Amaryllidaceae) subgenus Amerallium with a focus on the North American species. American Journal of Botany 101:63-85. Scott, T. 1999. What is the chemical process that causes my eyes to tear when I peel onion? Scientific American 21 October 1999. Vaughan, J. G., and C. A. Geissler. 2009. The new Oxford book of food plants. 2nd ed. Oxford University Press. Volk, G.M., A. D. Henk, and C. M. Richards. 2004. 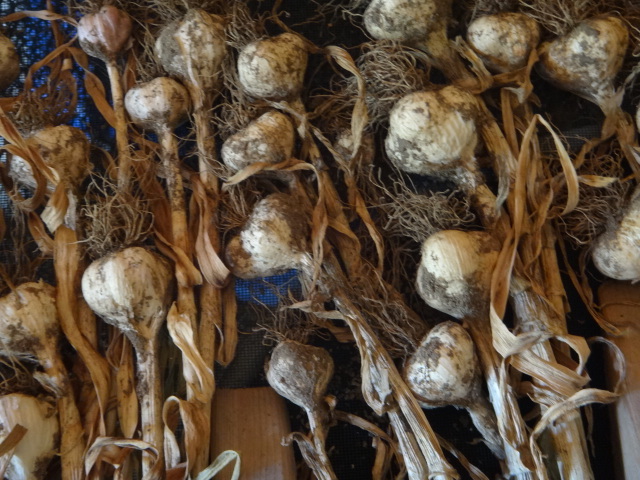 Genetic diversity among U.S. garlic clones as detected using AFLP methods. J. Amer. Soc. Hort. Sci. 129:559-569. This entry was posted in Uncategorized and tagged allium, amaryllidaceae, angiosperm, Brassica, Brassicaceae, chemistry, chive, convergence, crucifer, defense, garlic, greens, Jeanne L. D. Osnas, leek, onion, phylogeny, ramp, recipe, sulfur, vegetable. Bookmark the permalink. “Can nursing mothers eat strong-flavored or spicy foods? So, while they corroborated the statement that flavour might be affected, upsetting baby’s digestion does not seem to occur. In the light of this evidence, would you consider changing the statement about breast milk in your post? Thanks for the careful read and for writing, Ada. My intention with that sentence is to state that breastfeeding moms are often warned about dietary compounds ending up in breastmilk to the detriment of baby. I hope the wording of the sentence does not imply that I think the warnings necessarily have merit. In that sentence I do not make a statement of scientific fact regarding whether the compounds end up in milk or what the consequences might be once they are there. Like you, I’d prefer a data-ridden citation about that. I was trying to conversationally note that in our society nursing moms are often warned about what kind of milk they’re making. I think it’s true to say that moms are warned about dietary compounds ending up in milk, but I haven’t looked for a sociology study about what sorts of lines nursing moms get fed. I was just speaking from personal experience as a nursing mom, regarding the warnings, not the compounds themselves. I’ve read this warning about dietary compounds in breastmilk in numerous baby info books, and I’ve heard it from numerous pediatricians. I haven’t looked up if this is the official line of the American Academy of Pediatrics and, if so, on what standing. I haven’t looked up any scientific medical literature regarding dietary compounds in human breastmilk and its consequences for infant well-being. It does appear that flavor compounds do, however, end up in cow milk, according to the USDA sources I do cite in the essay. It’s always useful for us to get feedback about what language works or doesn’t work for our readers, so I really appreciate your comment. I won’t change the sentence in the essay, because I think (but could be wrong) it is properly constructed to convey that women are warned, not that the warnings are a statement of fact. Hopefully our conversation in the comments will clarify the issue for interested readers. But I’ll take heed to use more clarity in the future in text regarding plants and human health.